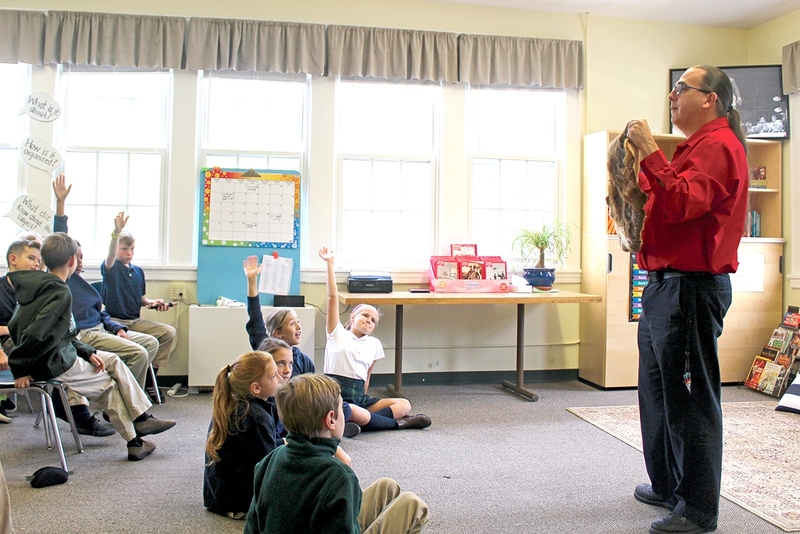 Akomawt Education Director Christopher Newell gives a presentation to students at The Unquowa School in Fairfield, Connecticut. For generations prior to the arrival of Europeans, North America was home to a substantial Native population. As their lives evolved over an astonishing expanse of time (archaeologists note evidence of human activity in New England some 12,000 years ago), the continent’s first inhabitants organized communities, created art and music, instituted social order and government, and managed the landscape to provide for food and clothing. By the time fur traders touched foot on North American shores in the 1500s, the northeastern region was home to powerful, autonomous nations: the Haudenosaunee, Mohegan, Pequot, Nipmuc, Mahican, Munsee, Quinnipiac, Narragansett, Niantic, and Wampanoag, among many, many others. In the decades leading up to the Revolutionary War, North America saw the influx of tens of thousands of Europeans, including indentured servants, and according to recent research, nearly 400,000 African slaves. In the ensuing struggles for control over territory, Colonists were assisted by an invisible and brutal ally. Smallpox and other epidemics ravaged Native populations, rending the social fabric of some communities. The economics of the fur trade exacerbated intertribal conflict. Yet events and primary sources show Native people continuously asserting their rights and directing their destinies. Considering their formidable history, it is worth asking why so little about Native cultures and values is commonly known today. Does our understanding of American history prioritize certain viewpoints? What can we gain by an approach to our past that examines dynamic, complicated truths? One passionate group of local teachers is determined to find out. Educator and researcher endawnis Spears recalls the late October day in 2016 when her then four year-old daughter brought home a construction paper headband and feather from preschool. While seemingly innocent enough, the headband and feather – typical of Plains tribal culture, and not New England – both troubled and disappointed Spears, who at the time was serving as director for programming and outreach at the Mashantucket Pequot Museum and Research Center in Ledyard, Conn.
“It pained me, not just for my daughter, but her friends and classmates who were learning inaccurate and culturally degrading information” about Indigenous culture, said Spears, who is Diné, Ojibwe, Choctaw and Chickasaw, and married to a Narragansett tribal official. The incident was a turning point and motivated her to reach out to two colleagues: the museum’s education supervisor, Chris Newell (Passamaquoddy) from Indian Township, Maine, and Jason Mancini, an anthropologist who specializes in Indigenous culture. “We wanted to search for ways to counter these inaccurate understandings of who Indigenous people are, our histories and our envisioned futures,” said Spears. What eventually emerged from this meeting of minds, in early 2018, was the Akomawt Educational Initiative, a movement to “re-indigenize history” in classrooms, museums, and cultural and historical centers across the state. Its long-range mission is reflected in its name, a Passamaquoddy word meaning “snowshoe path” – a fresh trail in the wilderness for others to follow. The organization aims to open up educational perspectives and clear ways to new understanding. Early America was an intensely complex place, Spears explained. Bringing to light lesser told stories not only honors the existence of remarkable people, but prompts essential critical thinking: Where do our stories about history come from? How do we know what we know? Programming is adaptable to various grade levels, from preschool through high school and college. In one session, students might examine how paper headdresses, dream catchers and the mythology of the “first Thanksgiving” in Massachusetts reduce the complexity and diversity of Indigenous people to cultural stereotypes. Others pose the question of where and when U.S. history actually began: at Lexington and Concord, Mass.? Or in Connecticut, with the 1638 Treaty of Hartford, one of the earliest formal agreements between Native peoples and English settlers. The treaty seized Pequot tribal lands, outlawed Pequot language and identity and disbanded the survivors of the Pequot War, many of whom were sold into slavery. Yet the endurance of Native peoples, including Pequots, shows that historical knowledge consists of much more than who won a battle or war. For example, the contributions of Native people to our diets today include tomatoes, potatoes, squash, beans, and hundreds of kinds of corn. Recognizing what we’ve inherited from traditional lifeways can be a great introduction to Indigenous cultures and science. While re-examining the past, Akomawt also seeks to help students understand the Indigenous people who live here to this day. Tactile experiences are one effective way to combat that assumption, Akomawt educators have found. Some of Newell’s presentations include traditional foods, such as sassafras tea, corn cakes or sweetened cranberry chutney, prepared by local Indigenous chefs. Students also learn about wampum (beaded shells used as currency) and the pelts of fox, beaver, and white-tailed deer, animals considered sacred in the worldview of Indigenous people – like all gifts from nature – and historically critical for their survival. The turtle also figures prominently in Indigenous cosmogony, Newell explains. The concentric, geometrical sections of the creature’s shell represent the thirteen lunar phases of the calendar year. “My students loved handling these objects and learning just how complex and advanced these peoples are,” said Tresor Kayumba, a fifth-grade social studies and literature teacher at the Unquowa School, a pre-K through eighth grade school in Fairfield, Conn. which Akomawt visited last fall. At the Dorothy C. Goodwin Elementary School in Manchester, Conn., where Akomawt has presented several programs, third-grade teacher Angela Janowski said she values the hands-on approach Akomawt offers, as well the way it gets students thinking in a different direction. “The question of whose voice is heard in history and whose is not is a question they do a really good job exploring,” said Janowski. Akomawt also offers professional development workshops for teachers which give them the tools to reframe misrepresentations students unknowingly gather from non-Native sources. “Every school around here has a Colonial unit in their history class. Rather than call it the Colonial unit, let’s call it the Connecticut unit, because from a Native perspective that’s what the river and the land was called by everybody who was dependent on it. So now all of a sudden, you’ve seamlessly opened the door for Indigenous history to enter in,” said Newell. For more information, visit akomawt.org. Mashpee Wampanoag Chef Sherry Pocknett talks with students about Native food and lifeways during a recent presentation at Goodwin Elementary School in Manchester, Connecticut. Students at The Unquowa School in Fairfield learn about Native food and lifeways during a presentation by the Akomawt Educational Initiative, a Connecticut-based indigenous learning project.